We all use headphones for music, calling etc.. Some of us use them much more than others. In simple terms a headphone is a listening device with a stereo loudspeaker system that can be worn over the head. It consists of an electro-acoustic transducer to convert electric signals into sounds. They are also known as headsets or stereo-phones. They can also be combined with microphone which converts sound to electric signal and can be used for communicating or recording. A wireless headphone is a headphone that doesn’t require any wires, cables or cord to use. They generally come with a transmitting unit which is also called as base unit. The audio device is connected to the base unit and the sound is transmitted from base unit to headphone using radio waves or infrared rays. The transmitter emits the wave and headphones receive the wave and convert the wave into sound which we hear from the headset. Both the headphone and transmitter work on batteries. Long Distance Operation: Wireless headphones offer long range operation and eliminate the hassles of connecting wires. Radio wireless headphones offer radio transmission in the range of 100 to 300 feet whereas infrared headphones provide range in the region of 30 feet. Bluetooth headphones are also available which gives greater freedom of movement as signals can travel through walls and furniture. Lightweight & Comfortable: Wireless headphones are very light weight, comfortable to wear and very convenient to use. They also have amazing battery life and some of them are even automatically rechargeable. They are perfect for those who spend a lot of time on their headphones. Noise Filtering: The special noise cancelling wireless headphones eliminate the loud distractions from the environment and are quite handy to stay focused and concentrated. They help to relax and be able to stay in one’s own world while listening to music, conversing, travelling or watching television. High Quality Audio: Wireless headphones provide high quality audio with excellent bass and treble. The crystal clear stereo sounds of headphones make it enjoyable experience for the users. The sound travels through two channel and is distributed in such a way that it feels real. Multi-tasking: Wireless headphones are portable and are a great multi-tasking tool. For example, a person can drive the car carefully and explain the business proposal to the client at the same time. Reliable: The wireless headphone also provides durability, longevity, and reliability as the user doesn’t need to worry about the wires or codes getting cut broken. Wireless headphones don’t support all media devices and thus user are forced to use analog headphones or earbuds. Some of the wireless headphones are subject to interference from external sources as most of the wireless devices use a standard frequency of 2.4 GHz. They create noise, jitters and latency in the receiving audio signal making it unpleasant experience for the user. The interference issues are the biggest problems associated with the wireless headphones and user need to keep the appropriate separation between wireless devices or change the channel to minimize the effect. Range: Managing the range another major issue related with the wireless headphones and can be very irritating. The problems like static, breaking up of sound, noise etc occurs if the user steps out of the recommended range. Battery: The other downside to the wireless headphones is the requirement of batteries. The battery life is usually poor and charge time is slow. Expensive: Wireless headphones of high-quality audio and good range are very expensive and can be stumbling block for most of the users. The good quality wireless headsets cost at least $100. The users also need to invest in rechargeable batteries and always keep a spare incase the batteries goes down. Turtle Beach Ear force PX5: The PX5 is the most technologically advanced headset targeted towards gamers and offers immersive high quality audio. The two radios are incorporated to provide Dolby Digital game audio and for chatting on the PlayStation network via Bluetooth. It is quite expensive and costs around $250. It is also perfect for listening music and watching movies due to its impeccable audio performance. It works on 2.4 GHz band and there are some interference issues with the wireless router. It works best in line of sight and its software doesn’t support Macs. 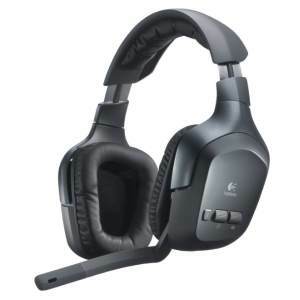 Logitech F450 Wireless Headset: It consists of a wireless base station with three analog inputs; hence it can connect upto three different audio devices including DVD player, game console, TV or other sources. It is comfortable and convenient with onboard controls on the right side of headset for controlling volume level and input selector. It uses 40mm laser tuned drivers to deliver stereo sound and uses 2.4 GHz band. It doesn’t support wireless Xbox 360 chat and costs around $150. Sony MDR-DS6500: It provides good sound clarity and allows great range of 300 feet. It is ideal for watching movies and allows the user to feel powerful action sequences and hear conversations clearly. It also uses 2.4 GHz band and provides 20 hours of battery life. They are quite costly and come in the range of $250. Sennheiser RS 170: It consists of a wireless headphone (HDR 170) and a multi-purpose transmitter (TX 170) which also functions as a charging and docking station. It provides dynamic bass boost and stereo surround sound and is perfect for listening to music or watching TV. It offers the range upto 260 feet and can connect upto 4 compatible Sennheiser headphones. It is quite expensive and cost around $280.